This adorable Build-a-Turkey Clip Art set is sure to brighten up your resources! 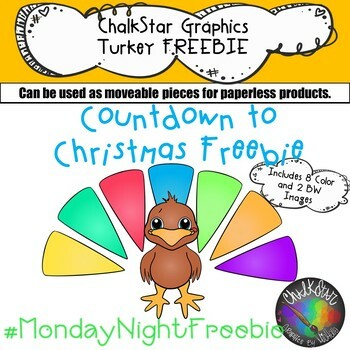 Click the green star to follow Chalkstar as we countdown the weeks until Christmas with a FREEBIE each week! All images are 300 dpi and come in PNG format with transparent backgrounds so the lines stay crisp and can easily be layered into your creations. The images are bundled into a zip file. Please be sure you have a program to open this type of file. ❥I love hearing your feedback, comments or requests. Don't miss out on freebies, flash sales and more! Follow Chalkstar on Facebook and IG for flash freebies and giveaways.